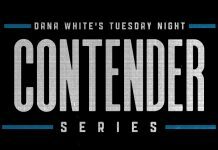 Another week of Dana White’s Tuesday Night Contender Series and yet another thrilling night of finishes. Of the 15 fights so far in season 3, 14 have ended by finish. I would say that the theme for this week was finishing…but that appears to be the theme of the whole season. So the clear theme this week was short notice victors as two of the three fighters fighting on short notice pulled out big wins. In the opening bout, we had middleweight action as Tim Caron took on Jordan Williams who came in on five-days notice. Yet one would never have guessed it as Williams completely dominated Caron with his superior wrestling for two and a half rounds until scoring the late finish with violent ground and pound elbows. The second fight of the night featured the featherweights. One of which was a familiar face in The Ultimate Fighter season 22 contestant, Julian “Juicy J” Erosa. Trying to claw his way back to the UFC, Erosa took on the rising prospect Jamall Emmers. The fight was thrilling and back and forth for the first two rounds as each showcased their striking skills each other’s faces. That was until Erosa landed a head kick that was too much for Emmers as he collapsed and was finished by punches. Right in the middle of the card was heavyweights. 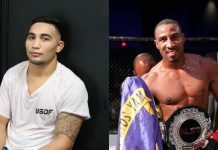 Coming in on four-days notice was Josh Parisian who scored an insane first round upset knockout over Greg Rebello who was returning from last season after a knockout loss and racking up some wins since. Parisian would spoil the night for Rebello with a crazy spinning back fist that made him the first fighter competing above welterweight in UFC/Contender Series history to score a spinning back fist knockout. 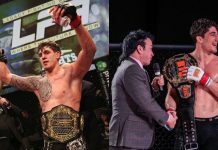 The night’s co-main event showcased perhaps the most impressive performance of the night as lightweights Te Edwards and Austin Tweedy clashed. And it wouldn’t last long as Tweedy would get hit with a huge right hand at the 28-second mark that put him out. 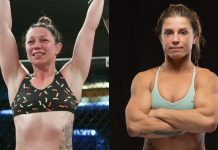 The main event would pit flyweights against one another in the first female bout of season 2. Short notice replacement for Silvana Juarez Gomez, Jaimee Nievara stepped up to take on the sister of Valentina, Antonina Shevchenko. The phenomenal Muay Thai striker put her skills on full display for the UFC as she applied numerous clinch positions and landed a plethora of nasty knee strikes on route to a second-round TKO win. Despite all the great performances from each winner, only two fighters received UFC contracts. Those being Shevchenko and Edwards with Parisian earning a spot on the next season of TUF while Erosa will be a standby for anyone who needs to be replaced in the near future. 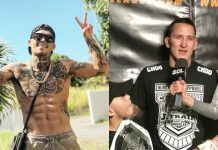 This article first appeared on BJPenn.com on 6/26/2018.